Search for all "Adenosine receptor A2b"
Goat anti Human Adenosine receptor A2b. Peptide with sequence from the C Terminus of the protein sequence (NP_000667.1). Peptide ELISA: 1/4000 (Detection Limit). Western Blot: Preliminary experiments in Human Colon, Lung and Placenta lysates gave no specific signal but low background at antibody concentration up to 1 µg/ml. 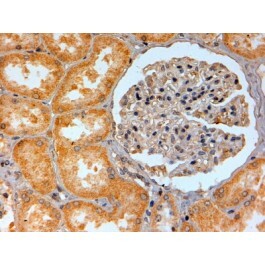 Immunohistochemistry on Paraffin Sections: 2-4 µg/ml. 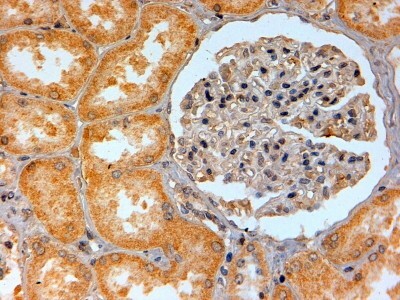 In paraffin embedded Human Kidney shows cytoplasm staining in cells of renal tubules. Adenosine is involved in a variety of processes, including the synthesis of urea, the anti-inflammatory response, and the inhibition of protein synthesis. The adenosine receptors, including adenosine A1-R, adenosine A2A-R, adenosine A2B-R, and adenosine A3-R, are integral membrane proteins that are members of the G protein-coupled receptor family. The A1-R protein mediates ureagenesis in a partially calcium-dependent manner. Adenosine is known to mediate coronary vasodilation via the A2A-R receptor. Collagen synthasis and total protein synthesis are inhibited in certain cells by adenosine, acting via the A2B receptors. Activation of the A3-R receptor inhibits the induction of the cytokine TNFα and blocks the endotoxin CD14 receptor signal transduction pathway. 1. Bazzichi L, Trincavelli L, Rossi A, De Feo F, Lucacchini A, Bombardieri S, Martini C. A2B adenosine receptor activity is reduced in neutrophils from patients with systemic sclerosis. Arthritis Res Ther. 2005;7(2):R189-95. Epub 2004 Dec 10. Affinity Chromatography using the immunizing peptide. This anitbody recognizes Adenosine receptor A2b.